It’s now one year on from Storm Desmond, the first of the storms that brought heavy bands of rain and caused significant flooding last winter. December 2015 was the wettest month for the UK since records began in 1910. Around 16,000 properties were affected by flooding in Cumbria, Northumberland, Lancashire, Yorkshire and Herefordshire. I was in Keswick shortly after the floods and saw for myself the devastating impact flooding has on lives and livelihoods and my heart goes out to everyone still recovering. There were a number of thoughts and emotions that struck me when I visited. Firstly the sheer scale of the impacts – streams that had become torrents leaving debris all around the riverside parts of the town to a level that was unimaginable even a day or two on. Thankfully in recent years we have seen few causalities from flooding but these volumes of water presented an immediate danger to life. Then, as with most disasters, what struck me next was the community and professional partner spirit and response. 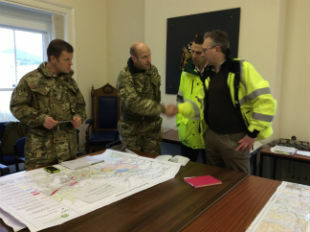 The local town hall had become the ‘flood’ HQ with groups of Environment Agency staff, volunteers and the army working tirelessly to help those affected and clean up the town. I met a squaddie struggling to hold back tears after cleaning out an elderly lady’s house – all of her belongings and memories emptied into a skip outside her house. 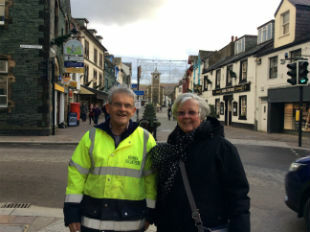 While I was there two volunteers, Graham and Carol, showed me around but also stressed just how much of Keswick was still open – they wanted to make sure people still came to support the local businesses in the run up to Christmas. These are the stories that stick with me after flooding and motivate me and our staff to help make this country as resilient as we can to future storms. We’ve undertaken a full programme of repairs to restore flood defences damaged by the storms. And that’s just what we’ve been doing throughout this year. Environment Agency staff have been working in communities affected by last year’s flooding to help them with recovery and to ensure that those communities are protected again before this winter. We’ve carried out a £65m repair programme, involving 20,000 inspections and around 660 repair projects, which has seen flood defences restored across the north of England. I want to thank all of those armies of volunteers, Local Authority and Environment Agency teams who have worked tirelessly. Many of our staff worked in incident response roles throughout the winter cancelling their own Christmas plans to work shifts and help affected communities. After the flooding we have reviewed how we worked and what else we can do in the future. This year we’ve focused on training more staff to do incident roles to ensure we’re resilient. Now 6,500 staff are ready to step away from their day job and do an incident role. That makes us more resilient and flexible. Staff who specialise in regulation, policy or customer service can also learn to do a crucial incident role. Since January we’ve completed over 130 new flood defence schemes, better protecting over 55,000 homes from flooding and we’re on track to meet our target of better protecting 300,000 by 2021. We are prepared to take action wherever it is needed this winter. We’ve improved our flood response investing in new kit including 40km of temporary flood barriers, 250 high volume pumps, and incident command vehicles. In October we held a major flood response exercise involving 1,000 staff training with our new barriers, pumps, vehicles, and drones. 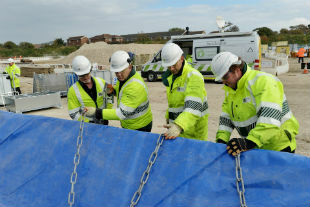 The ‘live’ exercises involved new equipment at locations across the Midlands, including at Nottingham and Lea Marston near Sutton Coldfield, and the South of England, including Shoreham-by-Sea. Staff also played in incident rooms responding to simulated flooding scenarios. In November we trained with the army so that soldiers can rapidly erect our temporary flood defences where they can protect communities. The Prime Minister announced that 1,200 troops are on standby to help us this winter. 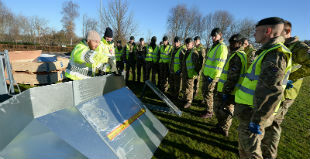 The Ministry of Defence has made this process easier to make troops can be mobilised more quickly to support partner agencies like the Environment Agency in case of emergencies. We’re making record levels of investment, spending £2.5 billion on new flood defence schemes. We’re using a combination of hard concrete or glass defences and ‘soft’ natural flood management - holding water back further upstream and planting trees. However, while we can work hard to reduce the risk of flooding we can never eliminate it altogether. This is why we encourage everyone to take some simple steps to prepare. You can call the Floodline hotline on 0345 988 1188 for advice. You can find out if you live in a flood risk area by checking your postcode online on the GOV.UK website and how to protect yourself and property. It’s great that over 1.3m people are now registered to receive our free flood warnings. These warnings are delivered by phone call, text or email and give people essential time to save possessions and move away from rising flood water. 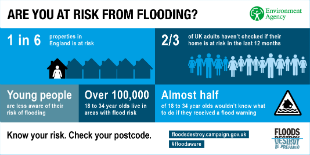 In November we ran a campaign to explain the risks of flooding and let people know what they can do to prepare. We joined with the AA and urged people not to put themselves in danger by driving through flood water. As well as advice from the Environment Agency, other experts and organisations gave really practical advice on the steps you can take to reduce the impact, damage, costs and time it takes to clear up after a flood. Those people who’ve been through flooding can share this advice, they are aware that signing up for the free warnings and knowing how to save possessions from damage can make a huge difference when coping with a flood. Read more in this blog by Mary Dhonau: Make your home more flood resilient. The Environment Agency is ready for winter. Are you? How do we protect our breeding fish at this time of year?